Teaching your dog to obey the command "back up" is both a fun dog trick and training that has practical uses. Your friends are sure to be amused and impressed when your pup walks backward on cue, just like a circus dog. Yet, it's also very useful if you need your dog to back away from an open door or to step back when it's crowding you during a game of fetch. Luckily, many dogs pick up this trick rather quickly. Others may take a little longer to learn it, but it's a fun command to add to your training sessions. Take a few steps away from your dog, and then turn and face them. Begin moving towards your dog. Some dogs will take a few steps back the minute you start moving in their direction. If your dog doesn't start stepping back as you move toward it, keep going forward, and try to lean your body forward slightly. As soon as your dog takes a few steps back, tell them "good" or "yes!" or click your clicker, and then give them a treat. Once your dog seems to understand the action, it's time to introduce the command. The next time, say "back up" as you move toward your dog. Continue to reward your dog when it backs up on cue. Most dogs learn to back up quickly. Practice these steps for a few minutes each day, and your dog will soon be responding to the back up command. If your dog fails to step back, a little more encouragement may be needed. Continue to walk towards the dog and when you reach them, use the part of your leg above your knee to very gently give a nudge backward. 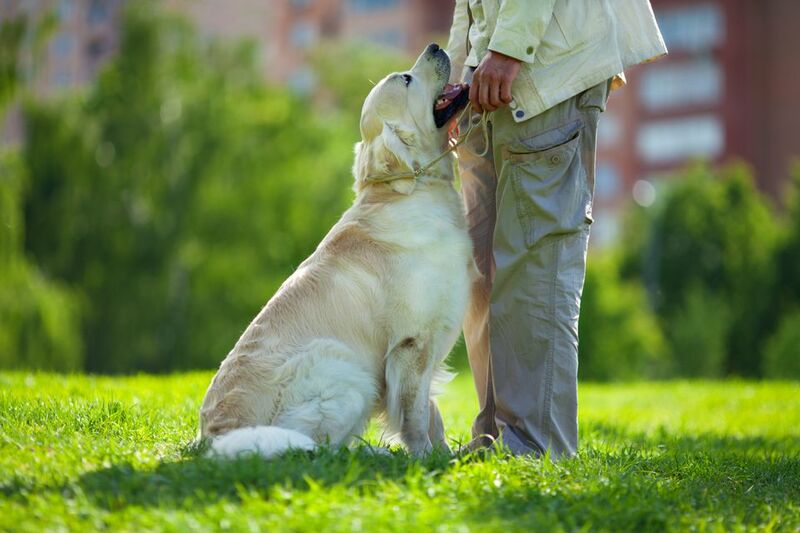 Your dog will naturally take a few steps back as you use your body to gently push it. Offer your praise or click your clicker and give it a treat as soon as the dog moves backward. Some dogs will get up and move away rather than backward when you attempt to teach this command. In this instance, you may need to move your training sessions to a narrow hallway or other enclosed space. Follow the same steps and make sure that your dog has no place to go except backward. Don't get frustrated if your dog is still not responding as quickly as you hoped. Every dog learns differently. It's important to keep training sessions short and positive; practice for only about ten minutes at a time. If backing up is too hard, switch to an easier action that your dog knows, like sit or down. Reward these behaviors and try "back up" again. If the session has gone on long enough, end with an easy action and reward your dog with treats and praise. You can always come back and try "back up" another day. Once your dog is regularly backing up for you, proof the behavior in various situations. For instance, do your next few sessions out in the yard where there will be a few more distractions. Then, try it at a friend's house or in the park. A dog who truly gets the command should be able to do it no matter the circumstances. Even though you may not use this command as often as others, it is important to practice it from time to time. Make a point of adding it to your regular training routine or even just asking your dog to back up at least once a week or every couple of days. This will help keep the command in your dog's memory.